In 1994, BMW made the curious decision to buy Britain's beleaguered Rover Group. It didn't work as well as they had hoped, and in 2000 they dumped all but one of Rover's brands: Mini. That ended up a smash success, but the car almost turned out very differently. Meet the Mini Spiritual Concept. Had the British engineers at Rover had their way, this rear-engine, rear-wheel drive hatchback would have been the new Mini Cooper that eventually came to market in 2001. Today, it remains a strange footnote in the fraught and troubled relationship between BMW and Rover that led to the Cooper as we know it today. You'll have to forgive me on being on something of a Mini kick lately because I just bought one. And Mate's story earlier this week on the bizarre Rover Mini prototype up for auction on British eBay led me to look more into the car's origins. It turns out that the development of the car that became the R50 Mini Cooper, launched in 2001, is rather fascinating. According to this great report in The Unofficial Austin-Rover Web Resource, Rover was planning on a modern Mini replacement as early as 1993. When the Germans bought Rover, BMW CEO Bernd Pischetsrieder — who just so happened to be the great-nephew of Mini creator Alec Issigonis — was all in favor of a Mini revival. As part of cost-cutting, rear drum brakes replaced discs. Functionally they were up to the job and (BMW executive William) Reitzle reluctantly agreed. Project costs were adjusted accordingly. Then by complete accident, in a casual conversation some weeks later between a Rover engineer and a BMW brake specialist, the German revealed that drum brakes were not being engineered. ‘There were so many times like that when we just didn’t know what they were going to do next. It was so baffling. We desperately wanted to show that we could do a good job, but they seemed to want to stop us’ adds the R50 veteran. Sounds like a tough environment, right? The two companies also wanted different things: Rover desired a true heir to Issigonis' inexpensive, ultra-space efficient city car, while BMW wanted a premium compact sporty car. I think you can easily guess which idea prevailed. But by 1995, the British team came up with the design you see here: the Mini Spiritual. It's actually two cars; the larger one was called the Spiritual Too, and it featured a longer wheelbase and more interior space. BMW ended up scrapping the Oliver LeGrice-designed Spiritual. The project then came down to either a practical hatchback with classic Mini styling cues designed by David Saddington or a more sporting, modern, pseudo-retro design from Frank Stephenson, then a BMW employee working within Rover who has since moved on to faster things. In the end, Stephenson's design won out, and Rover and BMW got to work. But the Spiritual remains a very interesting concept. What was it? A pair of compact economy hatchbacks designed to be to the 21st century what the original Mini was to the 1950s and 1960s: clean-running, affordable, cheap on gas, and roomy on the inside. They were designed at Rover's technical center in Gaydon and first debuted at the Geneva Motor Show in 1997, but even by then they were already two years old and ruled out for production. What were the specs? The Spiritual was just 10 feet long, like the original Mini, with as much volume as the Fiat Punto of the time. The Spiritual Too boasted the same interior space as a BMW 7-Series and Mercedes-Benz S-Class. It has a few heritage cues from the original Mini, including the round headlamps, the grille and the winged Mini badges. Both cars had a Hydragas suspension as well. Also, very much unlike every production Mini before or since, the engine was in the rear of the cars, which sent power to the rear wheels — not unlike a Smart Fortwo. What else made it special? Like the first Mini, it had four wheels at each corner of the car to maximize interior space. Since it didn't have an engine up front, it could do this a little better than the Mini that went to production. What did it look like on the inside? Curiously, I can't find any photos of the interior, nor any details about it. If you've seen some, feel free to post them in the comments. Did it actually run? Supposedly the car had a K-Series Rover engine in the back, but it's not clear if the prototypes actually ran or not. They were featured in an Autocar photo shoot in 1997, but that didn't include a test drive. Many people within Rover championed the Spiritual hard, but BMW was unmoved: this car did not accurately reflect the spirit of a Mini for the 21st century. One thing its publicity within the company did do, however, was to move the emphasis of the new car back towards being a roomy car – something that Stephenson’s coupe-like proposal certainly was not. Should it have been built? I'm gonna go with "No" on this one. The Spiritual is an interesting concept, for sure, and a great idea for a city car that oddly enough wasn't unlike the BMW Z13 concept. But it's not a Mini. Not really. It's hard to imagine this cheap, bubble-like city car being as big a hit for BMW as the cute, sporty, fun R50 and its descendants were. Reception to the Mini Spiritual and Spiritual Too were lukewarm when they finally debuted in Geneva in 1997. Plus, if there was ever a car that deserved to be front-wheel drive, it's the Mini. That car is a huge (no pun intended) reason why the front-drive, transverse engine layout is so prominent today. Sure, a rear-engine, rear-wheel drive Mini sounds fun, but front-wheel drive is just a part of the car's heritage. Another funny aspect of the Spiritual Too is this: even back in the early 1990s, Rover saw the potential of for an entire range of Mini models. Sound familiar? Maybe the Paceman and its ilk aren't entirely BMW's fault, although they certainly took that idea and ran with it. I'll also argue that the final Mini Cooper's neo-retro design helped make it a big hit at just the right time. That car debuted in the same era as cars like the Volkswagen New Beetle, the Chrysler PT Cruiser, and Ford Thunderbird; you could maybe even lump the 2005 Ford Mustang in to the end of that era. Stephenson's final product is easily the best-looking of any BMW-era Mini, and I think that played a prominent role in its success. As for the ending to the Mini saga, it was just as crazy as the beginning of it. BMW and Rover continued to fight each other as development proceeded. 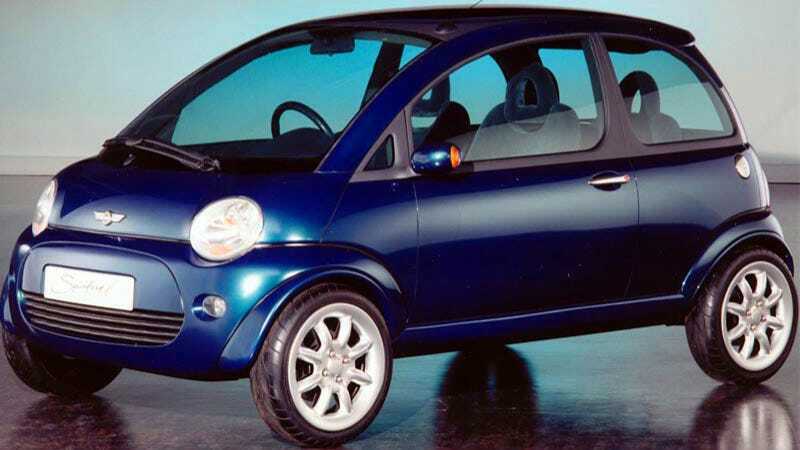 By the late 90s BMW pretty much had taken the project over entirely, and despite desperate pleas from the Brits to let it stay with Rover, they kept the Mini brand after they sold off the rest of the group in 2000. The new Mini Cooper launched in 2000 and has become both a crucial part of BMW and what's left of the British auto industry. Today, 1 in 9 BMWs produced are Minis, and the cars make up a very substantial amount of British auto production; the new 2015 Mini Cooper's platform will also underpin new front-wheel drive BMWs. Sure, it's become much more of a small premium car than Issigonis' economy hatchback. But the little car is a big deal, and I'm not sure the Spiritual would have pulled that off.